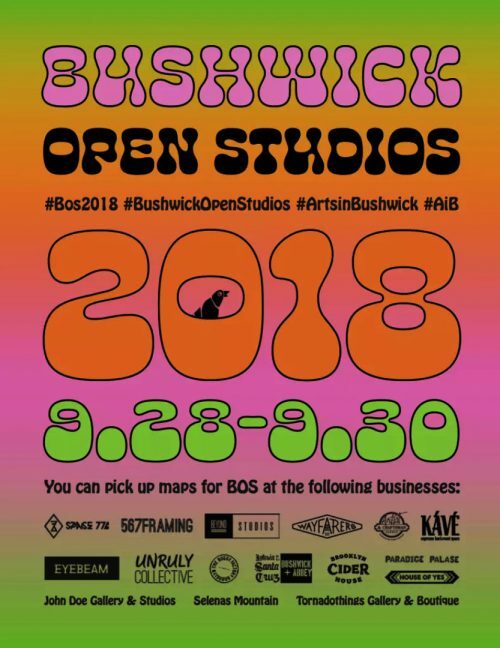 Bushwick Open Studios — #BOS2018 — returns this weekend! Though it of course can’t compare to our own neighborhood’s (and Greenpointers-produced) Greenpoint Open Studios earlier this summer, this weekend’s art fest in Bushwick will be a blast of art filled fun and madness. Take a tour of the industrial chic neighborhood we all love and take in some local art while investigating open studios. Hundreds of Bushwick artists will have their studios open Saturday and Sunday for visitors to meet them and see their work. For the 2018 edition of BOS, Art During the Occupation Gallery is pleased to show SUPERMASSIVE BLACK HOLE, a painting solo by Sharilyn Neidhardt concerning the rootlessness, alienation, and ultimate freedom of city living in the 21st century. For a timeline of events, see below, and for more info, visit the BOS site here. Art During the Occupation Gallery — in partnership with our friends at Trans-Cen-Der Art Group, Temporary Storage Gallery, and Brooklyn Fire Proof — are throwing an art networking party to mark the LAUNCH of 2018’s Bushwick Open Studios Festival. Come to the Brooklyn Fire Proof building to take in four floors of local artists! Run by Art During the Occupation Gallery Bushwick — a not for profit contemporary art space showing subversive and difficult work — BOS is an annual event celebrating the multitude of talent and artistic achievement Bushwick has to offer. They delight in serving as a platform for discourse on work that is challenging to authority paradigms, feminist, queer, anti-establishment, hyper-aggressive, mystic, and/or joyously sexual. Our gallery was launched in 2015 by Christopher Stout who serves as gallery founder and director.